Narrated by Simon Baron-Cohen, this DVD presents viewers with the opportunity to both see and hear about the nature of Asperger Syndrome from children and adults themselves who have AS, as well as from their family members and school teachers. With video footage from a range of contexts, including leisure time at home, lessons and playtime at school and individual accounts of experiences of AS, it provides insight into the lives of six individuals, from Joe, aged 5, to twins Peter and Matthew, 22. 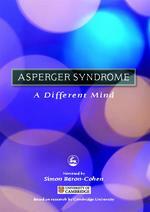 Asperger Syndrome: A Different Mind introduces the viewer to the special interests, speech and language characteristics, social interaction difficulties and cognitive challenges of people with AS.